A section of the crowds who turned out for the previous Clipper Festival. Derry’s popular Clipper Maritime Festival will take over nine days this year starting on July 9. 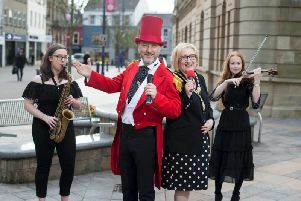 A “packed programme” has been promised for the festival, which has proved a massive hit on the previous two occasions when it was staged in the city. Next week local businesses will have the opportunity to attend a special event to find out how they can get involved in the Clipper Race 2015-16 homecoming celebrations set to take over Derry in July 2016. The Clipper Race Engagement Event is being organised by Derry City and Strabane District Council and will take place in the Guildhall between 10am to 1pm on Thursday, January 21 from 10am to 1pm. The event is open to all local businesses keen to find out more about how they can engage with the Foyle Maritime Festival programme. In 2014 the Festival generated visitor numbers of almost 150,000, with the riverside thronged with spectators there to greet the arrival of the 12 strong Clipper 70 fleet while also enjoying the entertainment laid on and peruse the stalls and other goods on offer. This year’s festival will take place from July 9 to 17, and will include a packed programme of both quayside and river-based events, presenting major opportunities for local businesses particularly those in the tourism and hospitality sectors, but open to all sectors. Mayor of Derry City and Strabane District, Councillor Elisha McCallion, said: “Our partnership with Clipper Ventures has been of major significance for the local economy, providing the opportunity for us to stage a world class festival and be a part of a major global sporting event. In 2014 the Foyle Maritime Festival generated £3,183,208 throughout the city and district, providing a significant boost to the local economy. Head of Business with Derry City and Strabane District Council, Kevin O’Connor, said expectations are even higher for the 2016 festival. He said: “The Business Engagement Event will give businesses the opportunity to preview the programme and come up with ways to engage new audiences and market their products and services effectively throughout the festival. To be a part of the business event next week, register your attendance by emailing Leeann.Doherty@derrystrabane.com.